Enter Breaker Blocks, an area-control tile laying game from designer Jacob Vander Ende and publisher Spriteborne. The concept here is pretty simple. Execution of the concept and development of a strategy is a bit more tricky. In the centre of the table is the “Circuit Core” – the larger “starting tile” that the players will begin building off. It has three individual circuits that reach player can build from (and compete for). The object of the game is to out-Power your opponent on more circuits. 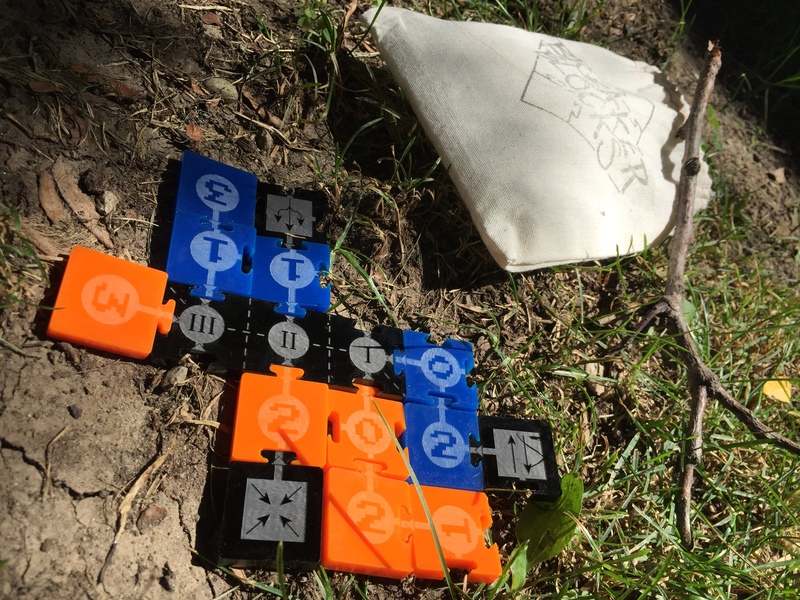 Each player will use their set of “Power Blocks” (orange or blue) to try and outscore a circuit, and there will be a set of communal black “Command” blocks that can be purchased to perform special actions. Each turn consists of taking two actions. You can pick a tile (any tile from your coloured power blocks to a neutral command tile), you can place a tile, or you can move a played tile. Player power blocks come in 0, 1, 2 or 3 power flavours. You’re free to pick them, but there’s a catch. Power 1 may be low power, but it will provide you with two outbound connector options (the most after your initial 0’s which have three outbound connectors), Power 2 will provide you with only one, while Power 3 will provide you with none, essentially closing off that circuit. This is a balancing act of picking the right power versus the right connectivity options. In the above image, Circuit #1 is tied with 3 power a piece. Circuit #2 is being won by blue with 4 power to orange’s 3 power… and orange cannot add any more to that circuit since the 3 block has no connectors. He would need to have that block destroyed or rearranged first. Circuit #3 is clearly being won by orange with 8 points to blues 3. So far, a tie game… the battle rages for Circuit #1! Neutral command tiles let you do special rule breaking moves, like targeting opponent tiles to destroy, or rearranging tiles, or drawing additional tiles, or even ending the game. Knowing how and when to play these is key. One of the two Authenticate tiles that together can end the game. Breaker Blocks is a really fun and highly challenging game of tightrope, where balance is imperative, and one wrong step can plummet you into failure. After a half dozen plays, I still don’t have strong strategic vision in my head when I face off against another player… but I feel like I’m getting closer to a theory. At first, I would race to grab the Authenticate (end-game) tiles to try and control when they might get played, but any decent player can pretty much prevent you from playing those by staying well ahead of you with Power, or by rearranging your Power to lose you a circuit. I truly appreciate that it’s a game which can be stuffed into a Hive sized sack and thrown into my backpack for hiking or canoe trips. It’s essentially indestructible… and I suspect that’s going to appeal to an awful lot of people. There’s a lot of thought that’s gone into the design, both from a component standpoint, and from a mechanical perspective. This is apparent on your very first game, but it only really resonates after a number of plays. Breaker Blocks is definitely a keeper. 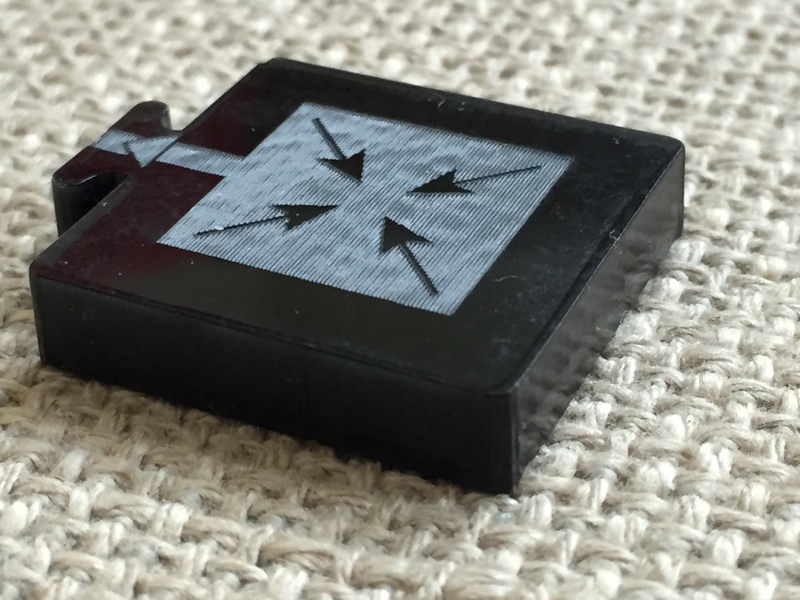 You can find more information on Breaker Blocks (including a downloadable PDF of the rules) at http://www.spriteborne.com/products/breakerblocks, where additionally you can purchase your very own copy for $25. Nippon and Signorie Pre-orders Are Up!